Lydia Chua is a member of Fitness First Pluit Village (FFPV) and a regular member of Bodyjam® class of mine and Anthony Kesuma. She’s our friend. She’s a healthy (fat) woman, very friendly, funny and adorable. With all those combinations, Anthony gave her a nickname N’DORO. That’s a very cute fatty name in my opinion. I don’t know about the detail, but they said N’DORO is a character of Java, a fat woman. We always describe Lydia (N’DORO) as a fat friendly javanese Goddess with her flying scarf. We adore and asking her blessing. She has no problem with that. She’s having her birthday. 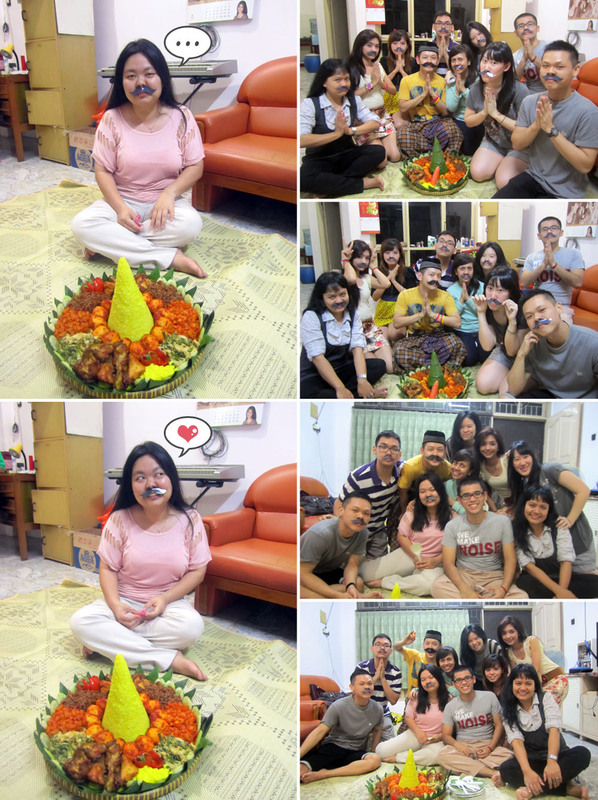 Evelyn (Jun Ki) Widjaya is a very active friend that always organize a birthday party for us. She suggested to make a special and unique party for N’DORO. Her idea: Not using Birthday cake, because it’s so common and ordinary. So, we gonna use TUMPENG*. 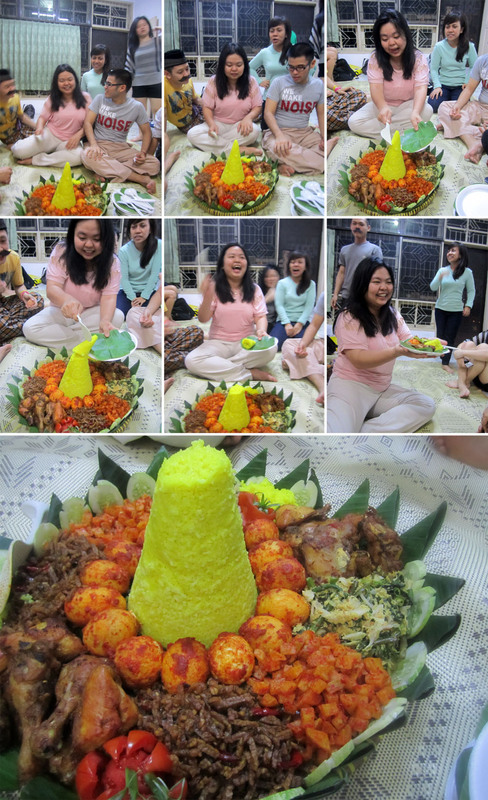 Tumpeng is a cone-shaped rice dish like mountain with its side dishes, traditionally featured in the slamatan ceremony and to express gratitude to God, appreciate togetherness and harmony. It’s a GREAT idea. We prepared a week before the celebration, Me, Debby, Jessy and Jun Ki are the committee of N’DORO Birthday Party. Had a hard time at the start especially searching the Best Tumpeng. Fortunately, Jessy’s Mom can make it, She gave us the tester, It’s good and the price is affordable. We discussed a lot to make it special. We will held the party in N’DORO house, Jun Ki has asked permission with her dad, had planning a scenario to bait her out. Meanwhile, Jun Ki will make Jelly or Pudding and Debby will buy a Watermelon, They’re so thoughtful. Here’s come the day, Saturday – 30th June 2012. What did I do ? I made some mustaches from photo paper, my idea is PAK RADEN, a popular character from Indonesia children TV series, doll story, UNYIL*. Pak Raden represents a hard working man with a rugged face and strong Javanese background who always wears a traditional Javanese suit. It suited our birthday party theme. I hope everyone will attach the mustaches, including the girls. They will be cute and ridiculously funny. After work, I went to FFPV. They’re still Bodyjamming in the class with Anthony. After finish, Jun Ki gave me her handmade N’DORO birthday card for me to write a greeting and draw an illustration on the cover. 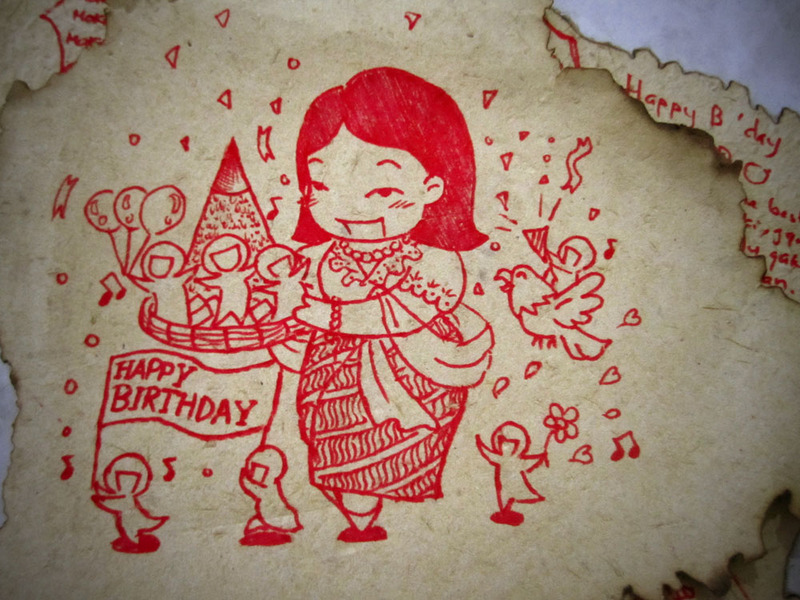 I drew N’DORO with Javanese blouse (kebaya) and scarf holding the tumpeng with some birthday celebration minions. It’s cute.. I love it! Now, we have a short time to prepare without her notice. Anthony and the rest will stay with N’doro at FFPV with scenario while the committee sneaking out. We have a great mission. I target Junki that we must finish in 1 hour. Along the way, I teased Jun Ki by whistling and singing the Mission Impossible theme song and warn her “You have 30 minutes..” (using Red Alert like sound) It’s intense!! 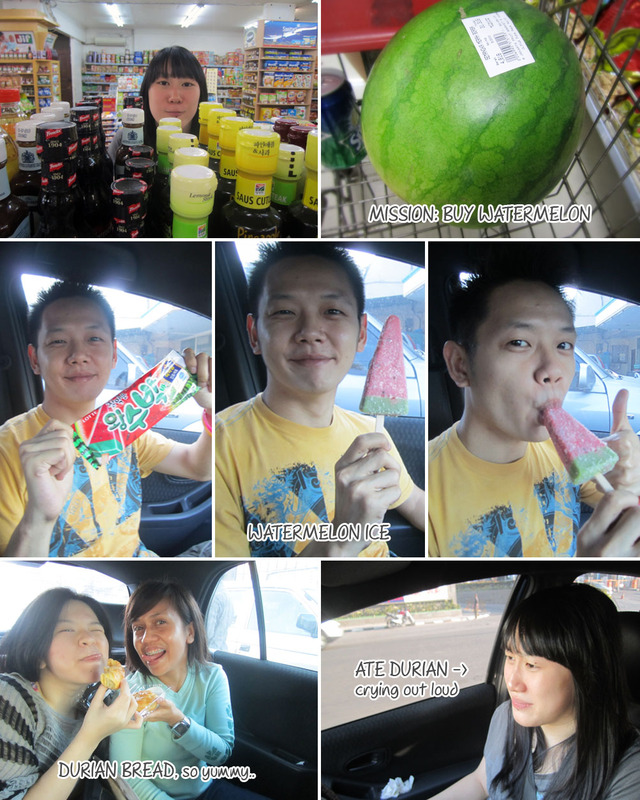 We went to Jakarta Buah, to buy Fresh Watermelon, suppose to be quick but we buy some snacks to eat. Heading to the Jessy’s house to take the Tumpeng. Wah! The Tumpeng is BIG and Heavy (about 5 kg), really great! Mission Complete !! We reached N’DORO house, her father help us prepare. 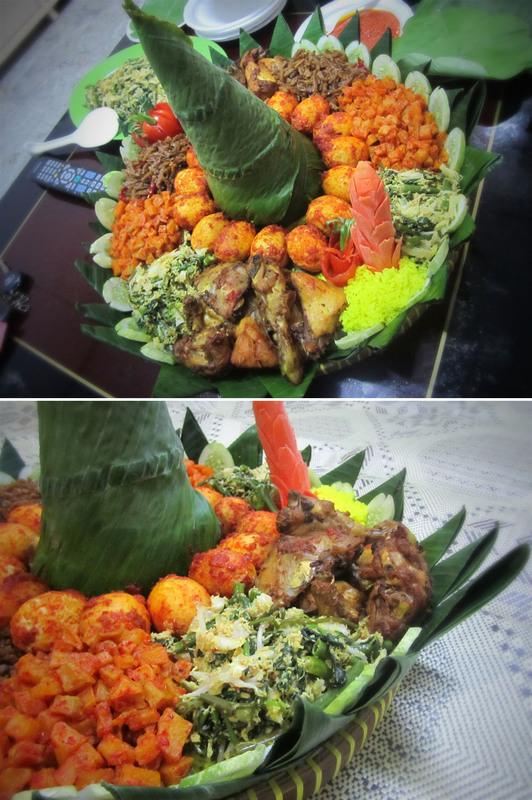 We start to set the Debby’s floor mat and open the Tumpeng, so nice! Love the color combination and composition. The side dishes are Tempe Oreg, Kentang Sambal, Telur Bulat Sambal, Ayam Goreng, Sayur Urap. I asked debby to bring Sarung and Peci (cap), I’m gonna be a birthday clown but this time with Pak Raden costume. I put on the mustache, sarung and peci, voila! I’m freakin’ ridiculous! 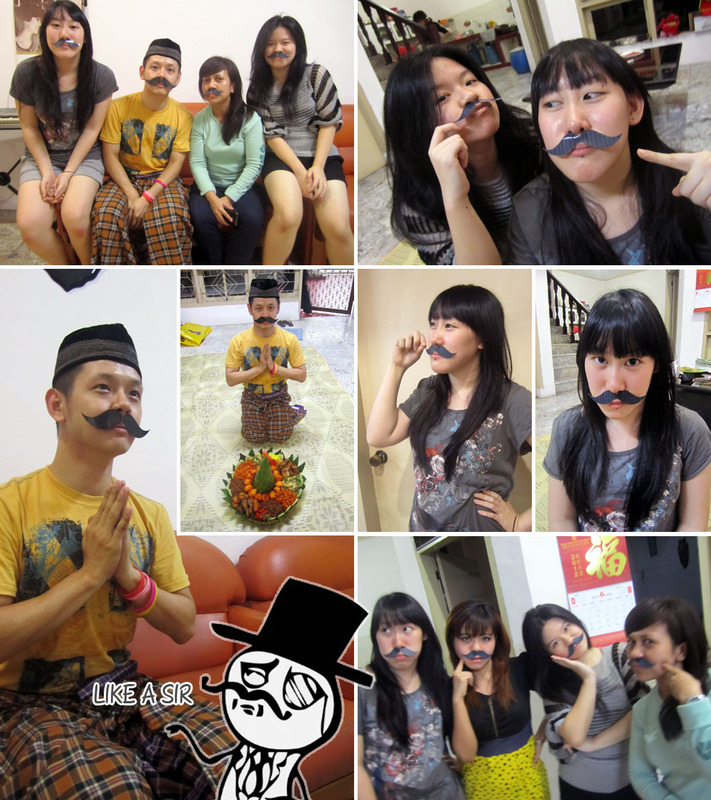 Then I asked Jun Ki, Debby and Jessy to put on the mustache. They like it and take some pictures. Had a mustache, Like a Sir! Now we’re giving signal to Anthony that we’re ready. We asked her dad to call her to come home soon. Evelyn (Epe) was coming alone, then follow by Maretha Dian (Mami). Unfortunately the timing when mami come wasn’t right! Anthony and the team reached at the same time. So, N’DORO has noticed the surprise. We locked the door, sitting down in position.. ready! OPEN!! “HAPPY BIRTHDAYYYYY !!!! !” She laughed the mustaches!! She surprised the Tumpeng!! We sing together and greet our Goddess! I gave them the mustaches, include N’DORO. They all put them on (I’m happy), They all look ridiculously cuteeee! Especially the girls, they look like a man! MACHO!! We took a lot of picture. This is FUN!! Then it’s time to cut the Tumpeng. First, N’DORO make a wish then using the rice spoon cut the top of the cone. Giving the first plate to her father. Then It’s our turns, we posed like asking for blessing from a Goddess. We kneeled and opened our hands, then N’DORO gave the food for us. I love this moment. We ate tumpeng, party, joke around and take pictures. The next event is.. “egg breaking, showering and flouring” the Birthday Person. It’s a common act to ‘bully’ the birthday person without notice. The Birthday Person must not angry of this act. This act represents friendship, to create a good/bad memory in his/her most happy day. The other act is push him/her to the pool. We baited N’DORO to go outside of the house, asking about her dog. Then suddenly, Jun Ki break the egg on her head… N’DORO, “Aww” …..the egg is NOT BREAK ! then Jun Ki quickly break on her head 3 times and break the egg like making an omelette. N’DORO shouted, aha! That’s the signal, I rushed out and showered the Sprite Soda then Johan poured (throw) her with flour !! It’s BRUTAL !! What did she do ? She chased everybody, she waved her hair wildly so the egg yolk + flour splattering around. We hide in the house. Ha ha ha, everyone laughed.. Then we have to clean the mess… and play again. After that, We’re sitting on the floor mat and playing game, a lot of laughs and cheers. Then one more food to serve, Jun Ki’s jelly. She made a white jelly with a “HAPPY BIRTHDAY” mold. It tastes sweet and fresh. It’s 9 am, we ended the party. Giving hugs and kisses to our Goddess, N’DORO. Wishing her all the best and forgive us about the mess we made ha ha ha. Happy Birthday.